Mike Byers | Washington Post – 2010 Post Hunt! A Huge Mutant Brainteaser. 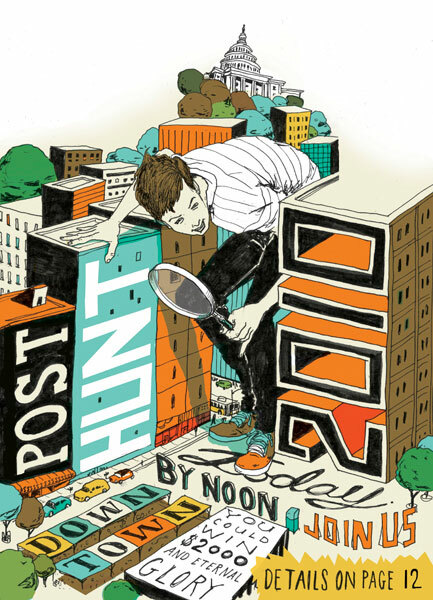 The Washington Post Hunt is a huge mutant brainteaser — a kind of urban safari, where you’ll be hunting for the answers to wacky puzzles woven into the landscape of downtown Washington. Compete against other teams to solve them and win a cool prize. Beautiful illustrations by MIKE BYERS! Hope to one day be able to participate in the hunt. See videos and photos and more on the hunt here!